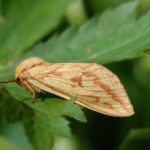 Some of the Moths of Ox Close. 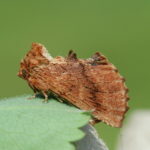 Early Thorn, (Selenia dentaria), first generation. 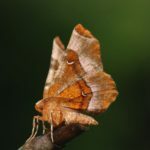 This is the only British thorn to rest with its wings held together over its body. 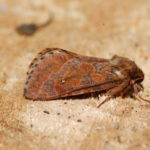 Purple Thorn, (Selenia tetralunaria). 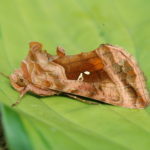 This is the more typical thorn resting position with its wings raised and half open. 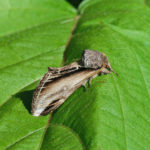 Lesser Swallow Prominent, (Pheosia gnoma) … the white wedge on the trailing corner of the forewing is more clearly defined and distinct. Eyed Hawk, (Smerinthus ocellata). 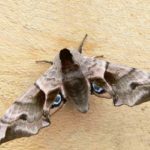 When disturbed it exposes the “eyes” on its hindwings to deter insectivorous birds. 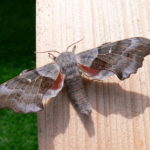 Poplar Hawkmoth, (Laothoe populi). 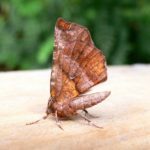 At rest the hindwings can extend well in front of the leading edge of the forewings. 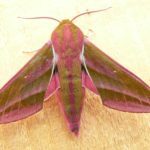 Elephant Hawkmoth, (Deilephila elpenor). The larva feeds on Rosebay- and Great- Willowherb and has striking “eye” markings on the front of its body. 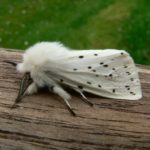 Buff Ermine, (Spilosoma luteum). Their colour can vary from buff to nearly white. 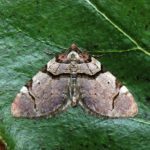 The Alder Moth, (Acronicta alni) is uncommon. 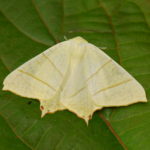 Swallow-tailed Moth, (Ourapteryx sambucaria). Unmistakable, but becomes paler with age. 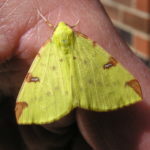 Brimstone, (Opisthograptis luteolata). 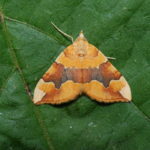 Who says moths aren’t colourful? 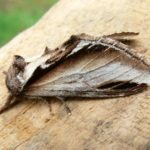 Plain Golden Y, (Autographa jota). 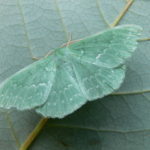 Large Emerald, (Geometra papilionaria) is a brilliant emerald moth whose colour soon fades to whitish-green. 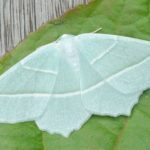 Light Emerald, (Campaea margaritata). 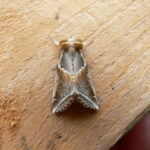 A fresh specimen: As with the other emeralds, the colour fades to whitish-green only a few days after emergence. 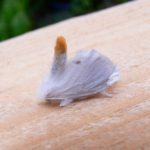 Yellow-tail, (Euproctis similis). 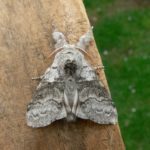 Its relative, the Brown-tail moth has been a pest at Spurn Point because wind-blown larval hairs can cause severe skin irritation. 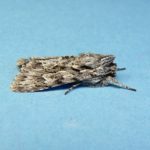 Ghost Moth, (Hepialus humuli), female. 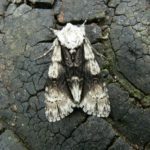 This is a primitive species of moth and gets its name from the display flight of the white male, which hovers, sometimes slowly rising and falling, over open ground to attract females. In a suitable location several males may display together in a lek. 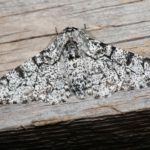 Peppered Moth, (Biston betularia). This is the colour form that is found in rural areas. Darker forms, to sooty black, predominated in urban areas, especially during times of high polution as they blended in and were camouflaged against sooty stonework. 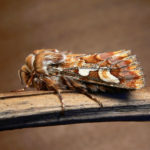 Map-winged Swift, (Hepialus fusconebulosa). Uncommon. 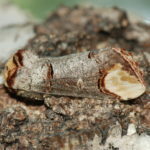 Buff-tip, (Phalera bucephala). 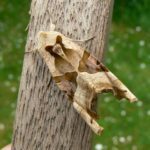 Evolved to mimic a broken birch twig. 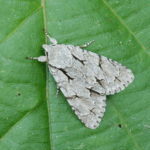 Buff Arches, (Habrosyne pyritoides). 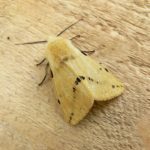 A beautiful and finely marked moth. 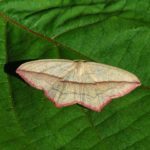 Blood-vein, (Timandra comae). 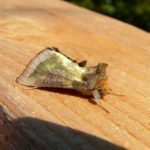 Easily recognised with its brown wing diagonals and pink fringes. 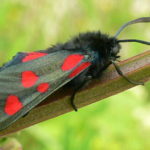 Narrow-bordered Five-spot Burnet, (Zygaena lonicerae): A day flying moth with clubbed antennae.